This section is designed for people who are not familiar with the Catholic faith. It particularly focuses on what Catholics believe about Mary. In the subsequent pages ‘Explaining Mary’ we will explain where in the Scriptures, the Catholic beliefs about Mary are found, so that fair-minded Christians may recognise and respect the unwavering intellectual integrity the Catholic Church has applied in its Scripture interpretation, even if they disagree. The aim is for respect not conversion. “Of all the obstacles littering my path toward the Catholic Church, none loomed larger than Mary. She represented diversion from true devotion to Our Lord to a plastic (or ceramic or marble) substitution. She was only the box that held the Present; did it honor the giver to play with the box and ignore the Gift? Depending which Catholic friend I spoke to, I heard qualities attributed to her that bordered on divinity, including titles such as Queen of Heaven and Mother of God. 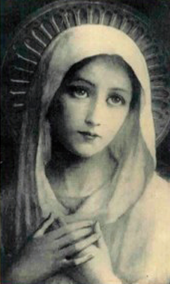 How could I reconcile the love for Jesus which I shared in common with Catholic brothers and sisters with the antagonism I felt towards Mary, his mother? Kimberly Hahn – ‘Catholic for a Reason II – Scripture and the Mystery of the Mother of God’ 2nd ed. Catholics believe that God reveals the fullness of truth to Christians through the Bible and through the ongoing guidance of the Holy Spirit. They believe that a range of truths are revealed by God, some of these are accepted by nearly all Christians, and other truths, such as the importance of Mary in God’s plan for the world, are not. Many people, even Catholics, wrongly believe the Immaculate Conception to be the event by which Mary came to be pregnant because the Holy Spirit came upon her and Jesus was conceived – so that God was Jesus’ Father and not a man. That event is the Virgin birth. In fact the Immaculate Conception is not when Jesus was conceived, but when Mary was conceived. Jesus is God - and His mother was Mary – so she is the mother of God. This is another truth which the Catholic Church holds to, but which is not of highest priority for salvation in terms of the Hierarchy of Truths. Heaven is inhabited by the Holy Trinity, angels and the souls of men, women and children. Amongst this collection it would seem perfectly reasonable for there to be a special place for the mother of Jesus; the specially chosen daughter of the Father and the Spouse of the Holy Spirit. Amongst the concerns that are most often expressed against the Catholic Church and which have no basis whatsoever in the mind of the typical Catholic is the accusation of idolatry in terms of Mary. The Catholic Church does not worship Mary and it would be a gross offense of the First Commandment if this were true.